Roessler Cellars is a Sonoma winery focused on producing Burgundian-style wines (most Pinot Noir but some Chardonnay too) from designated vineyards. Wine Spectator rated 15 different Roessler Pinot Noirs alone from the 2007 vintage ranging in price between $28 and $56. 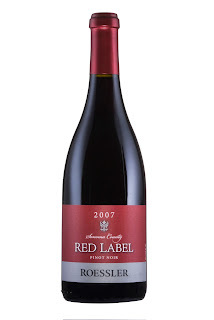 Being the cheap skate that I am, this Sonoma County Red Label came in at the bottom end of the price range but towards the top end of the ratings range: $28/92 WS and was therefore a notable value-play in looking at Spectator's ratings of '07 California Pinot Noir. Visually, this medium bodied red presents itself in a shade of magenta. Very clear visually- not cloudy at all. Classic Pinot Noir ripe strawberry aromas on the nose, which evolved over time with hints of spice and chimney smoke at Christmas time. Floods the palate with vibrant flavors of red raspberries, and slightly sour cherries. Silky smooth finish. Quite enjoyable and not disappointing at all. Purchased from VinoDivino in Newton, MA. They don't show availability of this Red Label anymore, but they do carry the similarly highly-rated 2007 Roessler La Brisa. Check out some of the other QPR-benders in Spectator's report. I think this 2006 Anderson Valley Pinot Noir might be an even better value than this Roessler. Question of the Day: Have you had Pinot Noirs from Roessler before? What did you think of them?